Pre-calculus courses have become increasingly popular with 35 percent of students in the U.S. taking the course in middle or high school. Often, completion of such a course is a prerequisite for calculus and other upper level mathematics courses. 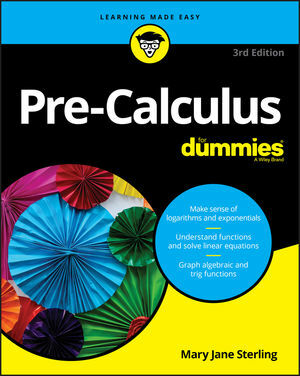 Pre-Calculus For Dummies is an invaluable resource for students enrolled in pre-calculus courses. By presenting the essential topics in a clear and concise manner, the book helps students improve their understanding of pre-calculus and become prepared for upper level math courses. Whether used as a classroom aid or as a refresher in preparation for an introductory calculus course, this book is one you’ll want to have on hand to perform your very best. Mary Jane Sterling aught algebra, business calculus, geometry, and finite mathematics at Bradley University in Peoria, Illinois for more than 30 years. She is the author of several For Dummies books, including Algebra Workbook For Dummies, Algebra II For Dummies, and Algebra II Workbook For Dummies.